The initial problem for me was that nearly everything I attempted, I succeeded at. If I didn’t find immediate success in a new venture, I quickly determined that it wasn’t worth my time. I didn’t understand the concept of working to become better at something because proficiency came naturally to me. I never studied for tests (I usually didn’t even know when tests were coming up, so everything was a pop quiz!). I applied (and was accepted) to nearly every school I attended between first grade and college. I started papers and readings the night before they were due. I rarely practiced stick skills on my own outside of lacrosse practice. It wasn’t laziness, it was efficiency. More so, it was all that I knew how to do. 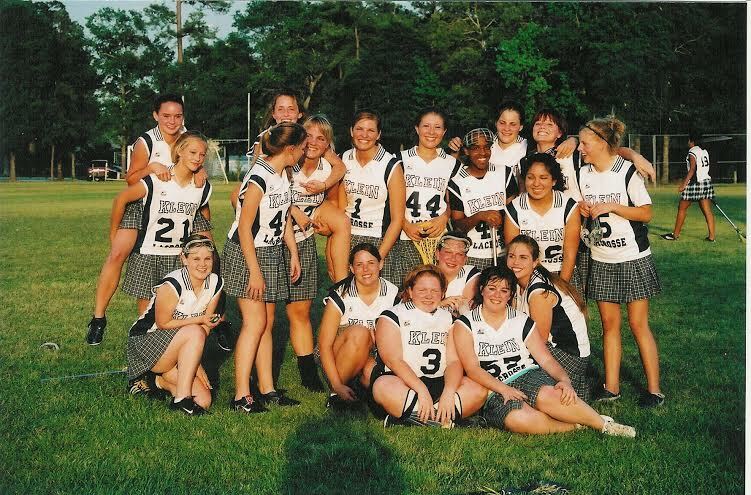 My high school lacrosse team circa 2005. Guess which one is me. Over the past 25 years however, life, coupled with a growing sense of patience and maturity, have taught me not only how to stick something out until I get better, but also when something really is worth quitting. Before my freshman year at Princeton, my goal was to walk on to the rowing team. This goal was a welcome distraction from the terrifying thought of leaving home to live far away, all while having to survive my first year of classes. I spent that summer in the gym on the rowing machine, steadily chipping down my 500 meter split in anticipation of joining the women’s lightweight crew. But by the time classes started, my small stature made me a more attractive candidate for coxswain on one of the men’s crews. It wasn’t what I had planned on, but I was amenable to the idea. I would still be part of the team and thus fulfilling my goal. I understood that becoming a coxswain would require learning a new skill set (that was part of what made the idea exciting) but what I didn’t realize was how slowly the skills would come to me. I’m still not entirely sure that they ever did. 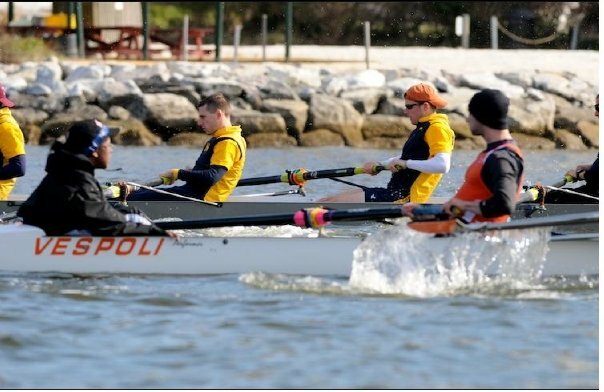 One of my first races, against a crew from the Naval Academy at Annapolis. Long story short, I was a terrible coxswain, and, save for a few brief races in which we beat Harvard, I had a largely miserable time on the team. But I refused to quit because I knew that it would burden my teammates. When the season ended, I walked off as eagerly as I had once walked on. Looking back, my only regret is that I didn’t quit sooner—not when the work became hard, when the hard work lost its joy and satisfaction. Triathlon training has been my strongest lesson in perseverance. Like life, triathlon is an endurance sport, and improvement comes only with patience. You simply have to live longer in order to learn how to be better, and nothing can rush the process of experience. Nothing can rush living. I started running four years ago. My background in sports was heavily sprint based (again, instant gratification), so any distance longer than a mile was daunting. I remember every major distance I accomplished—my first 3 miler, 4 miles, 6 miles, 8, 10, 12 and beyond up to the 26.2 miles in the LA Marathon that I completed last March. And after four years I still love running. I still marvel in childish amazement at how my feet can take me places that I’ve only ever driven to, as long as I’m willing to run long enough. I started swimming two years ago, and thanks to my coach and wonderful Tower 26 swim team mates, it’s been a slow but steady process to improvement. And curiously—immensely fun. I’ve never been a morning person (there was one point in college where 12:30pm classes were still too early…), but I somehow find the will to trek out to 5:45am practices—cold, groggy, hungry and even in the rain. I show up nearly every week for ocean swim workouts, despite how much they used to terrify me. 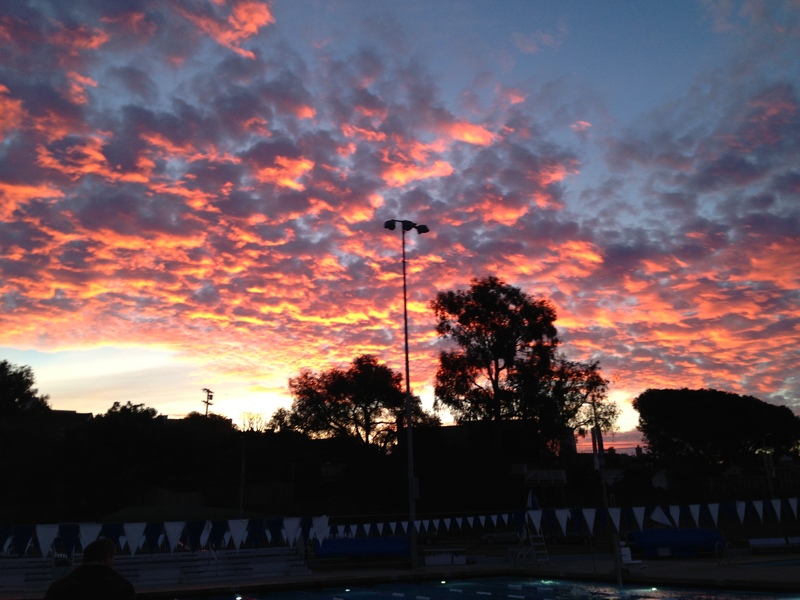 Sunrise over morning swim practice. These are two sports that draw from me hard work, but they also put in what they take out, filling me with joy and satisfaction. I mention these two sports in order to contrast them against my experience with cycling. I’ve been cycling for just over a year and I must say that I still haven’t quite developed a taste for it. In fact, I think the openness that I once held toward the sport has slowly soured into bitterness. When I was twelve I loved riding my bike—up and down driveways, careening around cul-de-sacs, popping wheelies and jumping off tiny ramps. For a few brief weeks I entertained the idea of becoming a professional stunt rider. But somehow all of this magic from my youth is lost in the sport of cycling. I still like riding my bike—leisurely strolls along bike paths on sunny days—but I hate cycling. Instead of leisurely strolls, it’s a sport fraught with fighting for road space against speeding cars, (spoiler alert—the cars usually win) and trying not to fall when clipping out. Or clipping in. Or slowing down, rounding a curve, changing gears, reaching for water, or attempting anything even mildly technical. I recognize that most of this has to do with the painful process of becoming comfortable and familiar with my bike, which has certainly happened over the past year. But I fear that all the comfort and familiarity in the world can’t make me enjoy climbing. I love hills as a runner, pounding my legs as they elevate me in a sort of ascension from the earthbound state of mere mortality. However, that feeling of elevation turns to degradation and turmoil on a bike. These California canyon roads have broken my body and crushed my spirit many times over, frying me under the magnifying glass of a blaring sun. And as bone crushingly painful as climbs are, descents are worse. Hurtling down two-lane highway roads just a few feet away from jagged cliffs of rock and desert brush, hands sore and raw from clinging to the brakes, hoping not to hit a rock or pothole or bump in the road and praying that God will return you back down in more or less the same condition as when you decided to go up. It’s no way to live, and this brings me to my dilemma. Cycling isn’t fun anymore. It quite possibly never was, but I wonder if it has reached the point of diminishing returns. With every new activity comes the potential for not just for success, but for pleasure. And I’m currently 0 for 2. Cycling has started to feel like yet another responsibility when I already have more than I care to maintain. Those who know triathlon understand that the bike can often be the foundation of any race. An athlete will usually spend more than 50% of race time cycling, so to enjoy racing is to enjoy some quality time with the bike. So far in 2014 I’ve had a fairly light race season—one marathon (LA Marathon), one swim race (Dwight Crum Pier-to-Pier), and one triathlon (Santa Barbara Long Course). Of the three, the triathlon was the least amount of fun. With my final race of the season approaching, I look toward the future, and I can envision a fulfilling athletic journey filled with foot races and swims, and for the first time I’m considering abandoning triathlons. But can I really? Triathlons appear to be the more glamorous of the individual sport races, boasting cooler T-shirts, finisher’s medals, course views, and an unbeatable sense of camaraderie from fellow triathletes. But the point isn’t to race for shirts or medals or courses. The point isn’t even to race. The point of it all is to find a connection with sport that fulfills an athlete’s drive for accomplishment and to become better than they were yesterday. This doesn’t require races. It almost doesn’t even require training, but doing. In the back of my mind, I worry that maybe things just haven’t clicked yet, that I’ll do a few more rides, a few more sprints and hill repeats, just tweak some technical pieces and everything will fall into place and I’ll suddenly love cycling. But I don’t. And I love other things more. And I’m willing to endure more for those other things. So as it stands now I have one last race of the season, a 70.3 mile Half-Ironman at Lake Tahoe in just under two weeks. I expect to see in this race the culmination of a summer of dedicated training and sacrifice for one goal—completion rather than competition. I like to think that in being a student of triathlons that I’ve learned the larger life lesson of how to progress from nonsuccess to success, but I also like to think that I’ve gained the wisdom to know when a cause is really worth backing down from. The main reason is that we can’t live our lives for just one day, for we’re not triathletes only on race day. We have to enjoy the process. We have to enjoy being triathletes every one of those early mornings when we wake up and might not want to go out but we do so anyway. When we know that we could turn around and go home but either the pleasure or the desire or something fierce and silent within us refuses to allow this. When we aren’t sure if we will succeed, but we know that we will try. Sadly, it doesn’t fit on my bike. Previous Article First Marathon Recap — 2014 LA Marathon! Great writing. As I have previously shared with you, I fully, whole-heartedly understand where you are right now. Just this year, I have finally gone on rides and had Fun. Try not to let this last race dictate your decision on triathlon. It took me a really, Really, REALLY long time to finally start seeing even small improvements on the bike (and the swim too, and yes, swimming IS more fun!). It is taking me a TON of specific & consistent riding, both on the trainer and outside, working on form and handling skills. Think about how many times a week we swim (3x?). Do you get on your bike that often, with the same focus as at the pool? Maybe, if you can, attend a triathlon camp next year. I believe you would get your $$’s worth out of it. Give triathlon at least one more season, making next season a cycling focus. Focus on handling skills during post and pre-season. Ride with a group. By the way, I will admit it. I still hate triathlon at least once a week, for some reason or another, usually because of a bike workout. But for me, it is the difficulty of triathlon that challenges me and keeps me coming back for more! I am right there with you. I love the run and the swim but the bike just doesn’t click with me. After a couple of bike crashes I am even more gun shy of it. It takes so much time to get better on the bike and so much money and so much effort (not the exercise part, I don’t mind that). I have been doing triathlon for about 4 years now and I am ready for a break. I am ready to simplify and just focus on one sport and use the other two as cross training. @Patty — Thanks for the encouragement 🙂 I’m wondering if a lot of it is the burnout of a quick ramp up for a 70.3 distance. I was thinking about the Malibu Tri course today and how much I’d love to be able to give it another shot. Maybe I’ll focus more on moderation during 2015. @Rebecca — That’s another thing, I feel like cycling is simply the most dangerous of the three. I’ve known too many people to count who’ve either been hit by cars or have suffered nasty crashes. I commend you for finding the courage to get back on and keep riding! The biggest thing for me now is that I don’t like for something to feel left undone, and if I stop cycling before giving myself the chance to actually get good, then I wonder if it will haunt me.